The iProp will bring an end to tired arms, sore necks, and strained eyes that are the result of using your tablet. Whether youÆre watching a movie in bed, browsing on the couch, or playing games on your trip, the iProp will replace your tired arms and hold your device where itÆs comfortable for you, so you can focus on the important stuff (the screen!). Why should I choose the iProp? The iProp is carefully designed and constructed of high grade materials to uniquely compliment the high-end design of your tablet device. ItÆs light and portable at only 8 oz, and the unique non-slip, soft-to-the-touch silicone shelf provides the perfect amount of stability, without obstructing the tablet screen. Easily adjust the angle of your tablet. Can be used in portrait or landscape mode. Mesh bag conforms to any surface, providing the freedom to enjoy your tablet computer on both flat surfaces, such as tables and benches, right through to soft and uneven surfaces such as sofas or the bed. 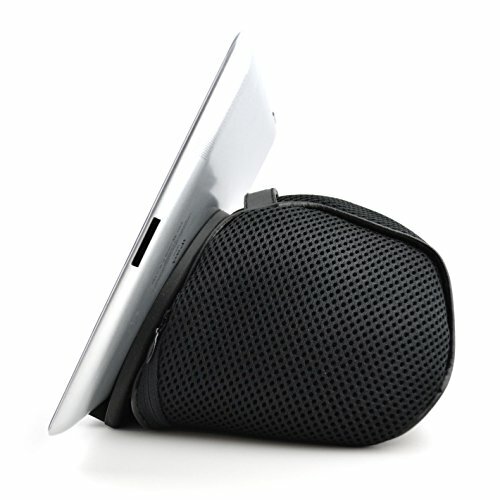 Small size is easily portable as a comfortable travel stand. Works with any tablet thinner than 18 mm, including the iPad, iPad 2, 3 & 4, the iPad Mini, Mini 2, & Mini 3, iPad Air and Air 2, Samsung Galaxy Tabs, Nexus 7 & 10, Dell Venue 8 PRO, Microsoft Surface RT, Surface 2, & Surface Pro 3, LG G Pads, Acer Iconia tabs, Blackberry Playbook, Samsung Galaxy Notes, Barnes and Nobles Nook tablets, HP Touchpads, HP 8, ASUS Tranformer EEE Pad, ASUS Transformer Prime, Toshiba Encores, Sony Experia Tablet S & Z, and many more. Easily conforms to any flat or irregular surface; the perfect stand for lounging around on the bed, sofa, chair, car, or airplane. Can use your device in portrait or landscape mode. Non-slip silicone shelf holds most any tablet and even tablets with cases on - anything under 18 mm (or the diameter of a US dime) should fit, including all versions of the iPad. Mesh, breathable micro-bead base is detachable and machine washable (beads also removable as well as the shelf). Bag can be unzipped which can act as a convenient carrying compartment for charging cords, ear buds, or small items. If you have any questions about this product by IPROP, contact us by completing and submitting the form below. If you are looking for a specif part number, please include it with your message.